LayerGripper Edition 4 LayerGripper Edition 4 is a combination of the patented UniGripper vacuum head technology with mechanical clamping bars and side skirts. The tool is weight optimized to enable handling of heavy layers using robots in the 500 kg payload range. LayerGripper Edition 3 is a combination of the patented UniGripper vacuum head technology with mechanical clamping bars and side skirts. 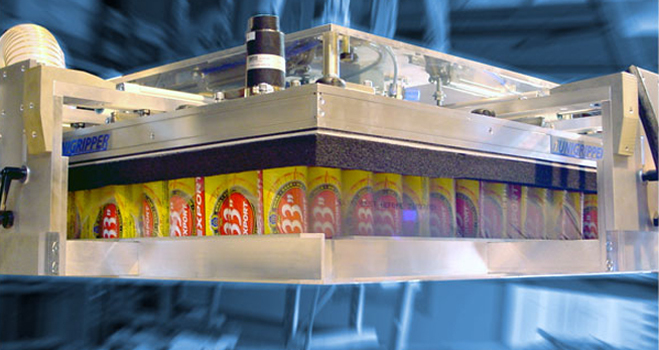 LayerGripper 3 is mainly targeted for gantry applications. LayerGripper Edition 2 is a combination of the patented UniGripper vacuum head technology and mechanical clamping bars.The clamping bars supports the lifted product and secures the grip even with high speed handling. Palletizing or depalletizing full layers is one of the most recurring UniGripper tasks. With the intelligent UniGripper valve designed can a vast variation of products be handled by the same tool, irrespective of if the layer is glass jars, aerosol bottles, paper cans or cardbord boxes, to name a few of the possible product types. The UniGripper LayerGripper comes in several editions, with different capabilities tailored for different requirements. Common accessories are suction cups for slip sheet handling and hooks for pallet handling to have one tool that can do everytihng for the palletizing or depalletizing task. The clamping height is manually adjustable, and can as an option be servo operated. The clamping force can be adjusted either manually or fully automatically by an EP-converter. 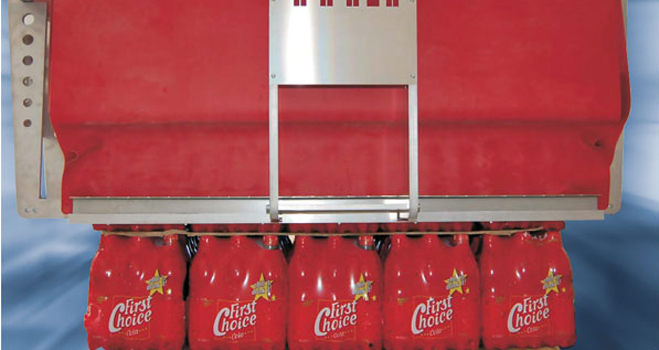 The rigid gripper-design can handle products from sealed boxes, without using the clamping bars, to products without possibility to use vacuum and then only using the clamping bars. Handles full or semi-full layers of products. Handle layers with gaps between products. Using vacuum and clamping: one by one or combined. LayerGripper Edition 3 is a combination of the patented UniGripper vacuum head technology with mechanical clamping bars and side skirts. The vacuum head also has integrated high flow on/off valve for increasing the benefit of the skirts, if needed. The clamping bars height adjustment is servo operated, and the clamping force is automatically adjustable. The rigid gripper-design can handle products from sealed boxes, without using the clamping bars, to products without possibility to use vacuum and then only using the clamping bars. LayerGripper Edition 3 has also capability to handle more than one layer at the time. The gripper can be used for both palletizing and de-palletizing of all types of products that occurs in a distribution center application. LayerGripper Edition 3 is designed to be operated by Portal Robots/Gantries. Handles full or semi-full layers of products. Handle layers with gaps between products. Using vacuum and clamping: one by one or combined. Servo positioning of the clamping height: speeding up the cycle time. Programmable force of the clamping bars: gentle on fragile products and powerful when needed. All type of products in cardboard boxes or trays, with or without plastic shrink wrap. Bottles on tray loose/and/or shrink wrapped. LayerGripper Edition 4 is a combination of the patented UniGripper vacuum head technology with mechanical clamping bars and side skirts. The vacuum head also has integrated high flow on/off valve for increasing the benefit of the skirts, if needed. The clamping bars height adjustment is operated with servo motor or with pneumatic cylinders, and the clamping force is automatically adjustable. The rigid gripper-design can handle products from sealed boxes, without using the clamping bars, to products without possibility to use vacuum and then only using the clamping bars. It has also capability to handle more than one layer at the time. 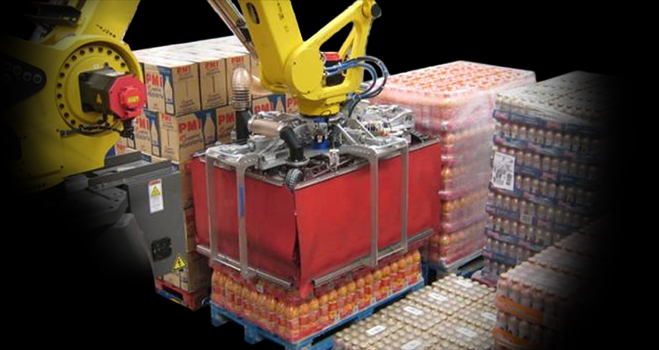 The gripper can be used for both palletizing and de-palletizing of all types of products that occurs in a distribution center application. LayerGripper Edition 4 is specially designed to be used on Robots.